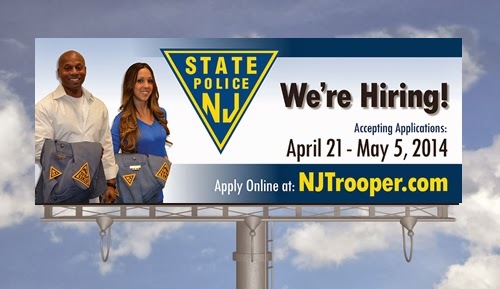 West Trenton, N.J. – Today, Acting Attorney General John J. Hoffman and State Police Superintendent Colonel Joseph R. Fuentes announced the dates for the opening of the New Jersey State Police application process. Applications will be accepted online from April 21st through May 5th. All eligible men and women are encouraged to apply. Those interested should visit www.NJTrooper.com to complete the online application. The Attorney General and Superintendent made the announcement at the New Jersey State Police Headquarters in West Trenton. Troopers can pursue one of the many diverse career paths that the State Police offers based on personal interests and specialized skills, while also working to ensure the public’s safety. “The nature of our public safety challenges change, but our mission remains the same. Whether we have a mass deployment due to Hurricane Sandy or a major event like Super Bowl XLVIII, public safety is our top priority. We’re looking for troopers with fresh perspectives and diverse skills to help us meet the challenges of the future.” said Colonel Rick Fuentes. The New Jersey State Police offers a great starting salary, excellent benefits and continuous training in over 120 exciting career paths. Applicants must be at least 21 years old and must not reach their 35th birthday prior to the graduation of their State Police class. Applicants must have: (1) a bachelor's degree; OR (2) a minimum of 90 college credits currently and complete their degree by a specified date prior to the written examination; OR (3) an associate's degree or 60 college credits, PLUS at least 24 months of satisfactory employment or military experience; OR (4) 30 college credits, PLUS at least 24 months of active duty military service with an honorable discharge. All college degrees/credits must be from an accredited college or university. Applicants must be a U.S. citizen and must have a current driver’s license. For more information visit www.NJTrooper.com. For additional information visit our website at www.njsp.org.